Behold the land of the Rising Sun and the wise men from the east. The land that flows with milk and Honey- (Obodo Chiukwu Okike Abiama Telu Mmanu). A nation who stood their ground in 1967-1970 civil war extermination by a world of injustice. A world that derive pleasure on the plights of the Indigenous people in mother Africa. The genocide that was committed against the blessed people of Biafra by the evil British government and sponsored by ex Prime Minister Harold Wilson, the Harold Wilson conspiracy that took the lives of about 6 million Biafrans during the genocidal war, all because of the mineral resources found in the Biafra land. It is a shame that the British government cannot feed her citizens without stealing our crude oil and looting us dry. However, Biafra is alive, strong, formidable, relentless, resolute and fearless before their enemies. The giant of black continent (Africa). The salt of the Ani (earth) has come to take her glory and crown back (Biafra). The leader of this global family, Indigenous People Of Biafra (IPOB), Mazi Nnamdi Kanu (POC) has been unlawfully detained since 14th October 2015 till date by the murderous agents of tyrant Muhammadu Buhari known as DSS. 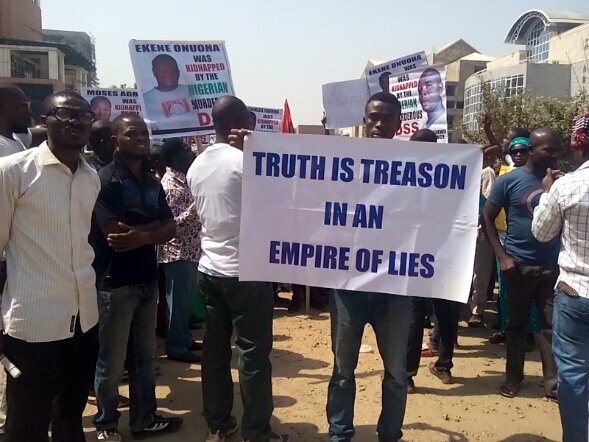 An illegal agency set up to humiliate innocent citizens who refuse to partner with the corrupt Nigeria government. It is noteworthy that the IPOB leader who is being detained illegally by the government of Nigeria has been granted bail and unconditional release by three courts of competent jurisdiction. However, the government of Nigeria led by tyrant Muhammadu Buhari refused to obey the court orders. Even the ECOWAS court ordered the release Sambo Dasuki, of which Buhari has flagrantly disobeyed. The worst is that the so-called ECOWAS has been bought over by the Nigeria government. We are now hearing that tyrant Buhari will lead delegations of ECOWAS dignitaries for peace talks in Gambia, for his fellow dictator to step down. What hypocrisy! Actually. Charity beings at home, not in another man’s country, our people always say that “A person whose house is on fire does not chase rats”. Glancing through the drama which occurred at the Federal High Court Abuja on 10th January 2017, with Injustice Binta Nyako, wife of the former terrorist and looter of Adamawa State, Murtala Nyako whose case is currently being investigated for several corrupt practices, one can only concur with Nnamdi Kanu that Nigeria is indeed a cattle republic. Tyrant Buhari hired Ms Binta Nyako to jail Nnamdi Kanu, a prisoner of conscience (POC) by all means before 20th of January 2017 when the elected President of USA, Donald Trump will be inaugurated. Injustice Binta has shown how unprofessional and useless she is. Binta has bastardized her career and the Nigeria judiciary for tyrant Buhari, an illiterate dictator. What a shame, the only language the contraption called Nigeria understands is violence; but it is certain that the beats of the music will change soon, because the Indigenous people of Biafra (IPOB) are on top of their game and no retreat no surrender. Where in the world will you accuse someone in public and turn around to try him/her in secret? Is such madness still prevalent in this 21st century? The leader of the Indigenous People Of Biafra (IPOB), and the Director of Radio Biafra/ Biafra Television (BTV), Citizen Nnamdi Kanu (POC) can never be tried on secretly because he is not guilty of any crime and should be released unconditionally before another war breaks out. Biafrans are not happy on the ongoing humiliations of their leader whose only crime is asking for the freedom of his people. Thousands of Biafra youths, Mothers, fathers, and children has taken to the streets of the world and Biafra land demanding for the unconditional release of their leader. Over 4000 Biafran young men, women, youths and children have lost their lives to the murderous Nigeria security agents since the abduction of IPOB Nnamdi kanu (POC). Self-Determination is enshrined under the United Nations Charter 2007 which the contraption called Nigeria is a signatory to. Injustice Binta Nkita Nyako Fatima ran away from the court proceedings even when the court session has not ended, immediately Nnamdi Kanu rebuffed her conspicuous secret trial move . The lion of the tribe of Biafra roared from afar that he would not allow such subjugation and humiliation by the tyrant Buhari to try him in secret. Such madness cannot be allowed because we are learned enough to be subjugated by illiterates who are drunk with power. She should resign honorably or be disgraced by CHIUKWU OKIKE ABIAMA (the supreme creator of the universe). Tyrant Buhari do not have the moral right to jail an innocent citizen who is exercising his fundamental human right as enshrined in the UN Charter for Self-Determination. Biafra is a spirit and an ideology that can never be defeated by a mortal man. Prophet Nnamdi Kanu (POC) controls 70 million Biafrans all over the world, and cannot be jailed for seeking for the freedom of his people. If anything should happen to him. The world will feel the heat because the fight will not end in the zoo Nigeria, it will be worldwide. It must touch every part of the world that has a hand in the genocide committed against the people of Biafra from 1966 to 1970. Prophet Mazi Nnamdi Kanu is an institution and cannot be subjugated. The world should come to our aid now and do the needful. The Nigeria security operatives have now resorted to kidnapping innocent Biafra activist on a daily basis and have executed hundreds of them secretly. One of the Biafra Journalists and activist, Moses Agbo of Family Writers who on 25th December 2016 visited the leader of IPOB, Citizen Nnamdi Kanu (POC). Till date, he is still hold hostage and has been undergoing severe torture on a daily basis. The world will know no peace until the people of Biafra are freed from this crime against humanity created by Frederick Lugard in 1914. The British government should also be held responsible if anything should happen to the leader of the Indigenous People Of Biafra (IPOB), Mazi Nnamdi Kanu (POC).